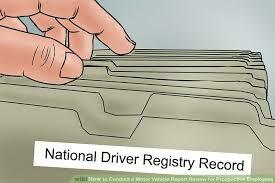 The National Driver Registry (NDR) What is it? Not many truck drivers have ever heard of it. But it could stop you dead in your truck if you are listed in there database. The National Driver Registry (NDR) is a computerized database of information about drivers who have had their licenses revoked or suspended, or who have been convicted of serious traffic violations such as driving while impaired by alcohol or drugs. If you have ever had a ticket in another state and did not pay it, you may be in the NDR. There is no time limit where these records drop off The National Driver Registry. Your States Department of Motor Vehicle provide NDR with the names of individuals who have lost their privilege or who have been convicted of a serious traffic violation. When a person applies for a driver's license the state checks to see if the name is in the NDR file. If a person has been reported to the NDR as a problem driver, the license may be denied. The NDR does not contain a list of any other drivers. If you have not had a driver license canceled, denied, revoked or suspended or you have not been convicted of serious traffic violations, you would not be listed in the NDR. Every individual is entitled, however, to request a check of the NDR records to determine whether they appear in the National Driver Register file. Any specific information about the driver history, or request for the entire driver history, may be obtained from the states(s) where the detailed information is recorded. The state(s) maintaining records are the (only) contacts able to correct records in error, and the NDR will correct its pointer records when so advised by a state indicating that a report previously made to the NDR is in error. If you are listed on the NDR the record is a starting point that will show you what state(s) have your records. Now you know where the records really are, you need to obtain them by filing with the state and obtaining your records. Look at the NDR report to see which state(s) you need to file with.. If there is only one state listed, you need to contact the respective state by downloading their form(s), completing them and then mailing them in. NOTE: You can download most state forms by Clicking Here and learn more information.